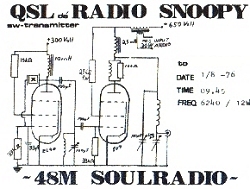 This station was the one that get most criticism to it’s acting against the listeners. The criticism they took as Radio Black Peter was nothing compared to them as Snoopy. The station did not answer the reports, but they wanted the listeners to write in to them. First after two years (1978) they began to answer the letters and then in a very raw way. They was first reported on air the first of august 1976 with a content of soul and pop-music. The language was Swedish with id’s in English and German. The Tx produced approximately 50 watts. In the beginning they was connected to FRL, but later they had an address in Holland. The OP called himself Benjamin Joyce. In the summer of 1977, the operator was involved in a car accident. A generator, a 200 W Tx and a smashed car became the results out of that. The Op got away with a few minor scratches.